Finally some good pics of Mary - and Christian. And we can rely on Daily Mail to inform us that Mary was born in Tasmania, lest anyone should be ignorant of that fact. The suspicious looking personage standing to the left of Frederik is the Prime Minister, Lars Løkke. It's usually Josephine who tends to steal the show, as the showgirl she is. Seeing Frederik, Mary and children there... all dressed in red and white cheering so committed and happy and proud... and Frederik handing out medals to the team with hugs and tears in his eyes... it was a wonderful evening. Judging by the thousands of comments this little loved family has become even more loved. We were proud Danes yesterday, they did well the Danish handball teams. Congrats to them. It was great to see (almost) all of the family attending the match. 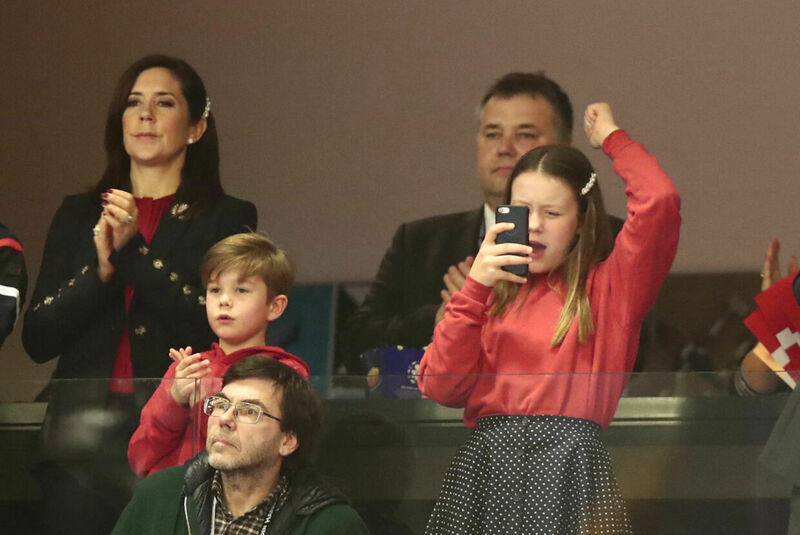 I love this photo of Isabella cheering and filming the event on her phone - she's turning into a typical teenager! I loved the red colour coordination from the family at the event too. That will probably also be dissected by "experts". So far I've seen two articles full of "experts" interpreting the fact that Bella was enthusiastic last night and that Frederik hugged most of the handball players he presented medals to. I haven't bothered to post them, but I can sum the articles up in one sentence: Captain Obvious strikes again! You've got to love a family that realises that being a "supporter" is a physical sport in its own right! Seems that Vincent has caught Isabella's enthusiasm for the game! Summary of article in Billed Bladet #5, 2019. 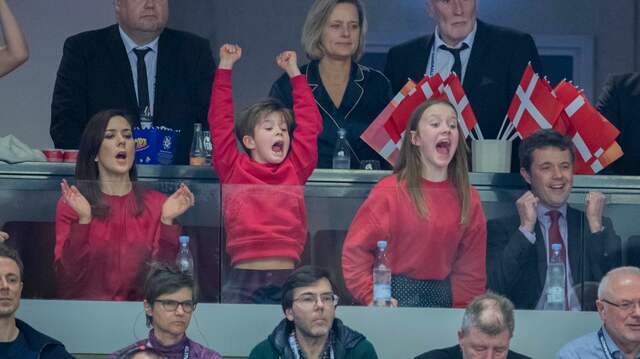 Apart from cheering the Danish team, exploding in pure jubilation when they scored, putting her hands up in despair when the Norwegian team managed to score, and taking part in the wave, Bella and family also joined the communal singing: Sailing up the river. Where you lock arms and rock from side to side singing a lyric you have to very drunk to forget! After the match Frederik presented medals and something that looked like an ashtray to the players and as many of them got a hug as well, including one player with the nickname, His Majesty. A son of one of the players, Linus age nine, is a kind of mascot for the team and Isabella was seen shaking his hand. Ulrik Ulriksen is not above "qualified speculations" in his articles. He wrote that Josephine opted for a cozy evening at home - probably in front of the telly watching the match. The group photo of the family that was posted on the DRF Instagram site has been the post with most likes so far. The same day the Queen visits Estonia June 15, Frederik and Mary will visit Vordingborg for the celebration of the Danish National flag Dannebrog's 800th anniversary. "The background for the celebration of the 800th anniversary of Dannebrog in the royal town of Vordingborg is that it was here that King Valdemar resided in Vordingborg Castle. Legend has it that the Danish flag fell from the sky during the Battle of Lyndanisse in Estonia June 15, 1219, where Valdemar fought against Estonians. With Dannebrog as war flag Valdemar beat the Estonians, and then the northern part of Estonia was a duchy under the Danish crown until Valdemar IV sold the holding in 1346th"
"We know from previous visits from the Royal House how popular it is, and I have no doubt that the Crown Prince Couple's participation in the celebration of Dannebrog will make it an even greater public party, which many will participate in, ”says Mayor Mikael Smed."